Tonight we are going to review a wine blend made of moreto, alfrocheiro and aragonês, where the first two are indigenous southern portuguese grape varieties, that forms the wine’s colour vector and the aromatic profile, while the last one is the key of this whole blend, as it forms the main body and structure. 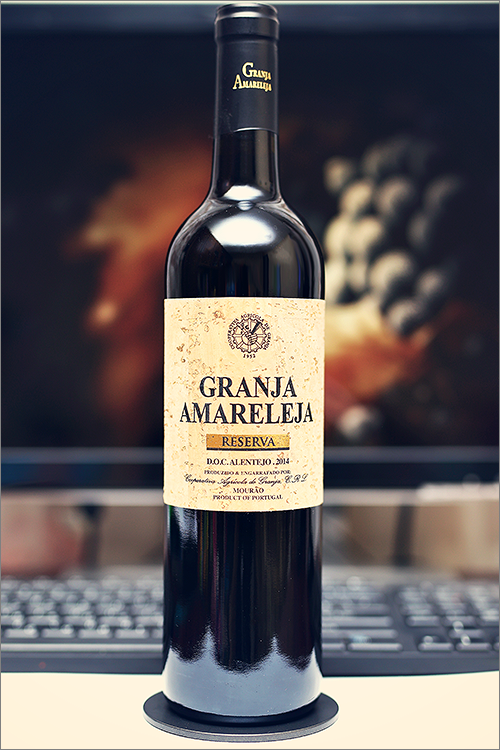 The wine we’ve selected for the review tonight is Alentejo Reserva 2014 from Granja Amareleja. This wine is a classic blend from Portugal, and it is based mainly on the aragonês, which is the southern portuguese name for tempranillo. Tempranillo is gaining in popularity in Portugal, both in the north as tinta roriz where it is an important ingredient in port wines, wines of the Douro valley and wines of Dão region, and in the Alentejo in the south where it is known as aragonês. But enough theory, let’s get straight to the tasting! Noble rubby color, not too deep nor too opaque, with shades of bright copper towards the rim of the glass. The nose is rich, filled mostly with ripe red fruits: sour cherry, red currant, cranberry, overripe sweet cherry, red plum, red raspberry and raw meat. An instant later the nose is filled with notes of red pepper, cherry tree wood, nutmeg, leather, sea salt and some subtle hints of tobacco. The wine is dry, with high alcohol level, high acidity and firm tannin. It tastes bold, fruity and salty, with a delicate old-world accent. This is quite tart and zesty wine, as it feels seedy and firm, with overwhelming acidity. The wine has a fair overall balance between fruit and wood and it makes an impression of a quite harmonic wine. It has a medium-plus finish and an balanced, bitter-seedy and a bit acrid aftertaste. This is definitely a fine Wine of Portugal and the overall rating says the same, with 89.9 points scored it is right there, among the best wines we’ve tasted so far. Please click on the chart icon on the left in order to get to the wine rating page, where you can find all the wines we’ve tasted to date. Conclusion: this is a quite a youthful wine, that has yet to reach its prime form, as it requires at least a couple more years of bottle ageing (2 to 3 more years will suffice) due to its overwhelming acidity. It has plenty of tannic grip on the palate, with a textured character to the mouthfeel and a touch of alcoholic warmth showing through. We would recommend to pair this wine with spicy or highly aromatic meat dishes, like for example some grilled lamb chops infused with rosemary and garlic or carne asada made with garlic and coriander in order to complement the leathery-spicy notes in the wine. Enjoy!